A police officer responds to a call in the Penn-North section of Baltimore City. Baltimore police stopped noticing crime after Freddie Gray's death. A wave of killings followed. 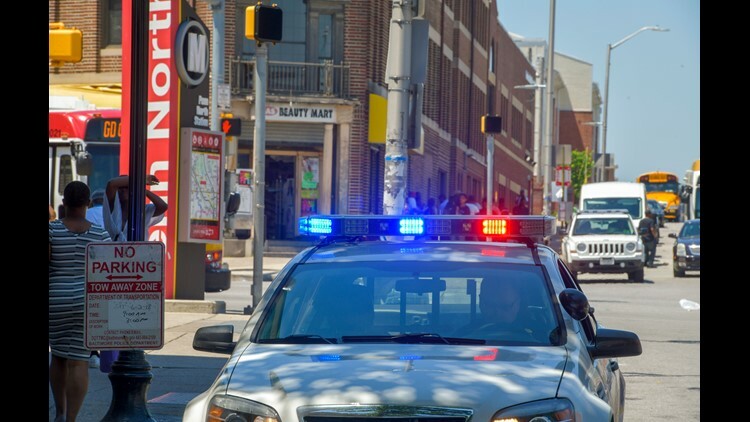 BALTIMORE – Just before a wave of violence turned Baltimore into the nation’s deadliest big city, a curious thing happened to its police force: officers suddenly seemed to stop noticing crime. In the space of just a few days in spring 2015 – as Baltimore faced a wave of rioting after Freddie Gray, a black man, died from injuries he suffered in the back of a police van – officers in nearly every part of the city appeared to turn a blind eye to everyday violations. They still answered calls for help. But the number of potential violations they reported seeing themselves dropped by nearly half. It has largely stayed that way ever since. “What officers are doing is they’re just driving looking forward. They’ve got horse blinders on,” says Kevin Forrester, a retired Baltimore detective. The surge of shootings and killings that followed has left Baltimore easily the deadliest large city in the United States. Its murder rate reached an all-time high last year; 342 people were killed. The number of shootings in some neighborhoods has more than tripled. One man was shot to death steps from a police station. Another was killed driving in a funeral procession. What's happening in Baltimore offers a view of the possible costs of a remarkable national reckoning over how police officers have treated minorities. Starting in 2014, a series of racially charged encounters in Ferguson, Missouri; Chicago; Baltimore; and elsewhere cast an unflattering spotlight on aggressive police tactics toward black people. Since then, cities have been under pressure to crack down on abuses by law enforcement. So has the U.S. Justice Department. During the Obama administration, the department launched wide-ranging civil rights investigations of troubled police forces, then took them to court to compel reforms. Under President Donald Trump, Washington has largely given up that effort. "If you want crime to go up, let the ACLU run the police department," Attorney General Jeff Sessions said at a gathering of police officials in May. Whether that scrutiny would cause policing to suffer – or crime to rise – has largely remained an open question. In Baltimore, at least, the effect on the city's police force was swift and substantial. Police typically learn about crime in one of two ways: either someone calls for help, or an officer sees a crime himself and stops to do something. The second category, known among police as an “on-view,” offers a sense of how aggressively officers are doing their job. Car stops are a good example: Few people call 911 to report someone speeding – instead, officers see it and choose to pull someone over. Or choose not to. Millions of police records show officers in Baltimore respond to calls as quickly as ever. But they now begin far fewer encounters themselves. From 2014 to 2017, dispatch records show the number of suspected narcotics offenses police reported themselves dropped 30 percent; the number of people they reported seeing with outstanding warrants dropped by half. The number of field interviews – instances in which the police approach someone for questioning – dropped 70 percent. Police officials acknowledge the change. "In all candor, officers are not as aggressive as they once were, pre-2015. It’s just that fact," says acting Police Commissioner Gary Tuggle, who took command of Baltimore's police force in May. Tuggle blames a shortage of patrol officers and the fallout from a blistering 2016 Justice Department investigation that found the city's police regularly violated residents' constitutional rights and prompted new limits on how officers there carry out what had once been routine parts of their job. At the same time, he says, police have focused more of their energy on gun crime and less on smaller infractions. "We don’t want officers going out, grabbing people out of corners, beating them up and putting them in jail," Tuggle says. "We want officers engaging folks at every level. And if somebody needs to be arrested, arrest them. But we also want officers to be smart about how they do that." The change has left a perception among some police officers that people in the city are free to do as they please. And among criminals, says Mahogany Gaines, whose brother, Dontais, was found shot to death inside his apartment in October. On a sticky morning in May, the Rev. 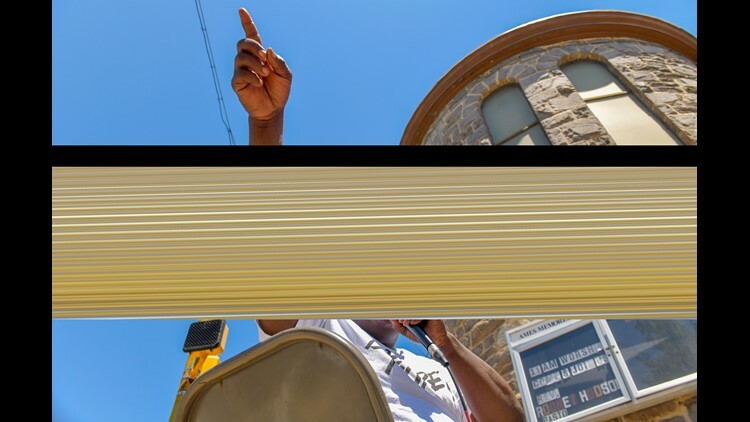 Rodney Hudson slips on a black “Sermonator” T-shirt and walks down the street from his west Baltimore church, a gray stone edifice two blocks from where police arrested Gray. A few days earlier, a drug crew from another neighborhood set up camp on the corner across the street. Hudson says the dealers nearly got into a gunfight with the crew that usually works across from the elementary school down the block. Since Gray’s death, at least 41 people have been shot within a short walk of Hudson’s church. Reverend, Rodney Hudson is the pastor of AMES United Methodist Church in West Baltimore, conducts a Bible study on the sidewalk in front of his church. Two blocks away, Mayor Catherine Pugh and a knot of city officials are under a tent on an empty lot to break ground for a group of new townhouses. Police officers linger on the streets, and a helicopter swirls overhead. But three blocks down Pennsylvania Avenue, drug crews still appear to be at work. Shouts of “hard body” – one of the drug cocktails on offer – ring clearly. Another man shouts a warning as Hudson and a reporter approach. Drug dealers have worked Baltimore’s street corners for decades. But Hudson says it has been years since he has seen so many young men selling so brazenly in so many places. Dealers, he says, “are taking advantage” of a newly timid police force. 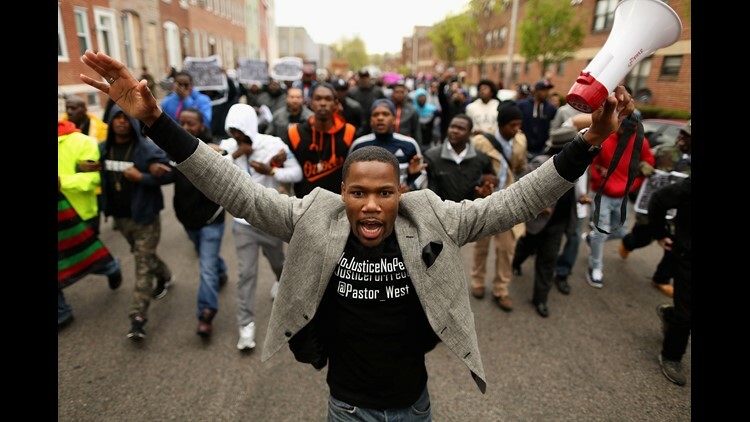 At least 150 people have been killed in Baltimore this year. Ebony Owens’ son, Decorey Horne, 20, was shot to death in 2016 in a parked car along the narrow street behind his aunt’s house. Another man who was with him was shot but survived. Eleven months later, the father of Owens' youngest son, Sherman Carrothers, was found dead outside his house with a gunshot wound. He was one of four people shot in the city that night. By almost any measure, this has been a troubled time for Baltimore’s police force. It began in April 2015, when officers in west Baltimore chased Gray, arrested him for possession of what they said was an illegal switchblade and loaded him into the back of a police van, handcuffed but without a seatbelt. By the time Gray left the van, he was in a coma. He died a week later. Protests followed, then riots. Prosecutors charged six police officers for Gray’s death but abandoned the case after three were acquitted. This year, eight officers in an elite anti-gun unit were convicted in a corruption scandal that included robbing drug dealers and carrying out illegal stops and searches. One officer testified that a supervisor told them to carry replica guns they could plant on suspects. Another officer was indicted in January after footage from his body camera showed him acting out finding drugs in an alley. The city’s new police commissioner, Darryl De Sousa, resigned in May after federal prosecutors charged him with failing to pay his income taxes. For civil rights lawyers and federal investigators, those episodes offer evidence of a police force in trouble and too often willing to trample the rights of minorities. But some officers drew a different lesson: “Officers no longer put themselves on the firing line,” says Victor Gearhart, a retired lieutenant who supervised the overnight shift in Baltimore’s southern district before he was pushed out of the department for referring to Black Lives Matter activists as “thugs” in an email. 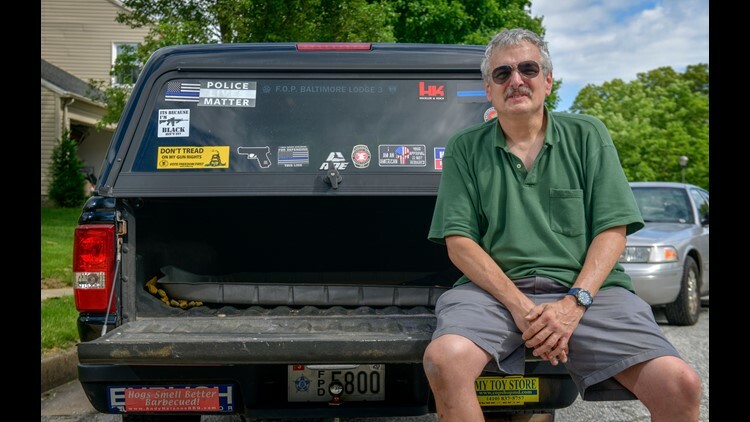 Former Baltimore Police Lt. Vic Gearhart, pictured at his Baltimore County, Md. home, says "officers no longer put themselves on the firing line." Gearhart and other officers say no one ordered them to make fewer stops or take fewer risks. "We didn't have to tell them," he says. "We just said these are the facts, this is the situation, and if you want to risk your career, have at it." That reaction fits a wider pattern. Nearly three-quarters of police officers who responded to a Pew Research Center survey last year said high-profile incidents had left them less willing to stop and question people who seem suspicious. Even more said the incidents had made their jobs harder. It has also drawn scorn from civil rights advocates, who scoff at the idea that police can’t protect both the city and the rights of its residents. To track the change in Baltimore, USA TODAY examined 5.1 million police dispatches from 2013 to 2017. They show that even before Gray died, the number of encounters Baltimore officers initiated on their own was dropping. But in the weeks after the 25-year-old’s death – after protests erupted into riots, and the National Guard came and left – the number of incidents police reported themselves plummeted. Where once it was common for officers to conduct hundreds of car stops, drug stops and street encounters every day, on May 4, 2015, three days after city prosecutors announced that they had filed charges against six officers over Gray’s death, the number fell to just 79. The average number of incidents police reported themselves dropped from an average of 460 a day in March to 225 a day in June of that year, even though summer weather typically brings higher crime. By the end of last year, it was lower still. Hundreds of demonstrators march toward the Baltimore Police Western District station during a protest against police brutality and the death of Freddie Gray in 2015. At the same time, violence in the city leapt to historic highs. Police recorded more than 200 murders and assaults involving guns in May 2015, triple the number in March. Criminologists who reviewed the records say it’s impossible to determine whether that rapid change played a role in the city’s rising crime, but some found the pattern troubling. Neither the mayor nor Kevin Davis, the city’s police commissioner until January, responded to questions about the changes. Anthony Barksdale, a retired Baltimore police commander, says the message to officers was unmistakable.